Hey World Cup fans: please don't damage Metro's buses! We will be the first to agree that the World Cup is a super fun thing to watch. It’s even better watching it in Los Angeles, where the diversity here means that many teams have huge and devoted local followings. Unfortunately, a couple of Metro buses were damaged in the civil disturbance on Tuesday following Mexico’s big win over Croatia that propelled Mexico into the knockout round of the tournament. 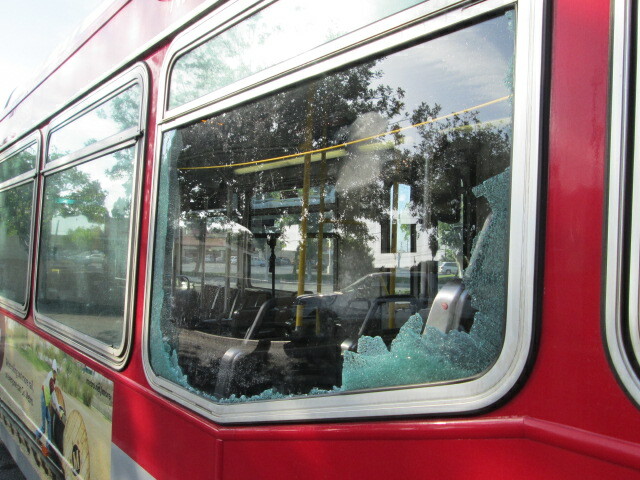 The above photo shows some of the damage to one of the buses. The buses are being repaired, meaning they are not available to do what they are supposed to do: serve our everyday riders. The repairs also cost Metro and you — the taxpayer — money that could probably be spent on better things. Thus, this announcement from Metro officials: Similar to past incidents where public safety is compromised, Metro will immediately suspend service in any area impacted by civil disturbances. Metro does not want to put its passengers, bus operators and other employees in harms way. Service will resume only when law enforcement deems it safe to do so. As soccer fans are keenly aware, Mexico plays the Netherlands on Sunday morning in the second round of the World Cup. It’s an elimination game, meaning everything is on the line for both teams. Metro will be closely monitoring the game and public safety on streets in our county. In particular, the following bus lines may be impacted: the 18, 94, 102, 111, 224, 230, 233, 251, 260, 612, 720 and the 761. When service is detoured or suspended, Nextrip will not reflect accurate real-time arrivals. To avoid potential disruptions or detours, customers should consider using Metro Rail when possible. There are tons of places to watch the game along the Red, Purple, Blue, Expo, Green and Gold Lines! Follow Metro’s general Twitter account or Metro’s Twitter feed with only service alerts for the latest rider information. Not to worry. Dutch fans would not do something so crass. HUP HOLLAND! Hey World Cup fans: please don’t damage Metro’s buses! Hey Everyone Who is Reading This: please don’t damage anything ever! A few days ago, The Source reblogged LA Weekly’s article on why white people (and per Metro’s own statistics, Asians as well) don’t take public transit in LA. This is your answer. No one wants to ride a bus with a bunch of soccer crazed hooligans who deface public property. You didn’t see this happening when the Kings won the Stanley Cup. And guess what, now the taxpayers have to pay for these damages too. As for the perpetrators who vandalized this bus? They’re probably roaming the streets of LA with not a care in the world because they know the cops aren’t going after them and it’s not their money to fix these damages. Why is The Source pushing rail so much? Metro Rail doesn’t go nearly as far as the buses do and is not a replacement. Not to mention, Metro Rail has plenty of disruptions and delays of its own—often much longer and more disruptive, too. Steve, just curious: how did you come up with the particular bus lines (18, 94, 102, 111, 224, 230, 233, 251, 260, 612, 720 and 761) that may be impacted? The list is from bus operations. This is a cute article but I’m pretty sure the population of people who smash Metro busses is different from the transit nerds that read this blog. As for Theo’s comment, you’re clearly implying that white people don’t riot and should avoid contact with Metro riders of color who apparently do. Pretty offensive stuff. No single race has a monopoly on idiocy. There are plenty of rioting white hockey fans in other cities (I’m looking at you Vancouver). It appears there is a certain number of sports fans across all races that enjoy a good post-victory riot whether it’s Lakers fans in LA, Canuks fans in Canada, or Liverpool fans in England. To those who think they can get away with damaging buses and rail cars. There are several cameras on each vehicle and along with cameras on businesses your chances of being caught are quite high. How can I take Metro Rail in the Huntington Park area? The police is not going to waste their resources in shuffling through dozens of security cameras to go after someone who smashed a window on a Metro Bus that’s worth less than $500 in property damages when they have other important high profile cases to work on. This isn’t the Boston Marathon bombing. Now if this was breaking a window and someone throwing a molotov cocktail and there were casualties involved then it becomes a high profile case. But what we have here is just a smashed window on a bus. Cost of police investigation to cost of damage done, do the math. The police will take a police report, it gets put into a pile of other paperwork, and it will be lost in the shuffle. That’s the extent of this case. In the end, no matter how you look at it, the taxpayers lose. You would surprised how many arrests are made using the on board cameras. Many times it’s the same suspect repeatedly. When taken into consideration it costs the MTA far more to replace a window when one considers the cost of the window, labor in replaceing it and lastly lost revenue while the bus is out of service. If it costs more than $500 in labor to replace a broken window and takes more than few days for the bus to be out of service and that’s the best excuse you can bring up to validate wasting people’s tax dollars by calling out the police at even more tax payer money, then Metro has serious inefficiency issues that needs to be addressed. I had my minivan’s windows smashed by hoodlums. The total cost to fix and replace the windows was $400 INCLUDING LABOR, and my insurance company paid for it and it was done in less than a day. If Metro doesn’t have insurance to cover damages like these, is spending a lot of money in union labor to replace a broken window that any auto mechanic can do, doesn’t have spare parts lying around for instances like these, and needs to take the bus out of service for more than a day, then Metro needs to stop being a waste on everyone’s wallet and look to privatization. These are not “sports fans” they are hooligans that use the cover of an event, whether it’s a sporting event, or some other event, to behave irresponsibly – hell chances are these people act irresponsibly all the time, but are using these events to create havoc, just because they can, and want to brag to their friends about how macho they are.